We're More Than Just The Academy. The Practitioners Leadership Institute was created to build leaders, mentors and active creators of opportunity. As you arrive at graduation and look to the future beyond the Academy, you should know that our relationship continues far beyond those seven months. PLI’s parent organization, the Center For Urban Families (CFUF) offers year-round opportunities for specialized training and technical assistance to meet your organzation’s needs. PLI and CFUF are here to provide hands-on training and support in the fields of responsible fatherhood, healthy relationships and workforce development. That’s right; we’ll come to you. PLI will embed themselves in your organization, have deep conversations with your leadership, and provide you with valuable feedback to help you hone your focus and discover your strong and weak points. Through development of custom resource material, we will help you strengthen your entire organization and staff, putting your best foot forward for everyone involved. “Teach a man to fish…” The strongest teams are those who are equally empowered to lead and develop, and by utilizing an open-style training, we will help to open your staff to new ideas and perhaps ask some new questions, too. At the end of the day, we hope to have encouraged growth and development within your organization. PLI’s parent organization, CFUF, has an excellent facility in the heart of Baltimore, and we are hosting training sessions all year long. These sessions cover a wide range of topics, all aimed to increase your organization’s ability to provide services in your area of expertise. These are great opportunities to increase your knowledge and share a room with like-minded, equally driven leaders. “We got training from national leaders on PROI [Program Return on Investment] analysis; that alone was a game changer. Through that PROI analysis, I was able to show grant funders that the return on investment with our program wasn’t just the level of funding we had (at that time, it was $480,000 a year), but our program was worth almost a million dollars a year because of the rate of recidivism that was reduced, as well as the Workforce Development Certification. Using CFUF’s own direct services programs as a model, our workforce development T/TA approach will allow organizations to better provide employment assistance to your community’s workforce pool. Your heart knows that when fathers are involved in their children’s lives, it benefits everyone in the relationship. Now, there is significant evidence to show that when fathers take a positive, active role in the lives of their children, the children experience less behavioral problems, improved social skills and better educational outcomes. Central to CFUF’s mission is the belief that men-the most disconnected and under served citizens in urban communitie-who connect with women, their children, and the workplace are key to the restoration of stability and optimism. With this philosophy in mind, CFUF has developed a training curriculum designed to help organizations establish a program that helps develop young fathers called THE D.A.D. M.A.P. : DEVELOPING ALL DADS FOR MANHOOD AND PARENTING. The curriculum provides an opportunity for programs to expose young, low-income men to fatherhood education, information, and skill development that is rarely accessible to them. The curriculum focuses on fathers who have an interest in exploring the possibility of formalizing their commitment to their children and families. The curricula and training are supplemented with a guidebook that is intended to provide program planning and implementation strategies as well as resources that organizations can use as a guide in creating or enhancing responsible fatherhood program. For the past two decades, growing evidence has shown that children fare better, on average, when raised by both of their parents in stable low-conflict households. Furthermore, studies have also shown that there is a higher rate of marital instability for economically disadvantaged couples and a lower rate of marital instability for non-disadvantaged couples. Additionally, over the past two decades, out-of-wedlock birth rates have risen. All of these trends are important rationales for the development of a healthy relationship initiative. CFUF has devised a technical assistance training based on a curriculum we developed called, THE BLUEPRINT: A GUIDE TO FAMILY STABILITY & ECONOMIC SUCCESS. The curriculum provides an opportunity for programs to expose young, low-income and never-married couples to healthy relationships education, information and skill development that is rarely accessible to them. We also provide a supplemental guidebook with the curriculum. The guidebook is intended to provide program planning and implementation strategies that organizations can use as a guide in creating or enhancing their healthy relationships program. 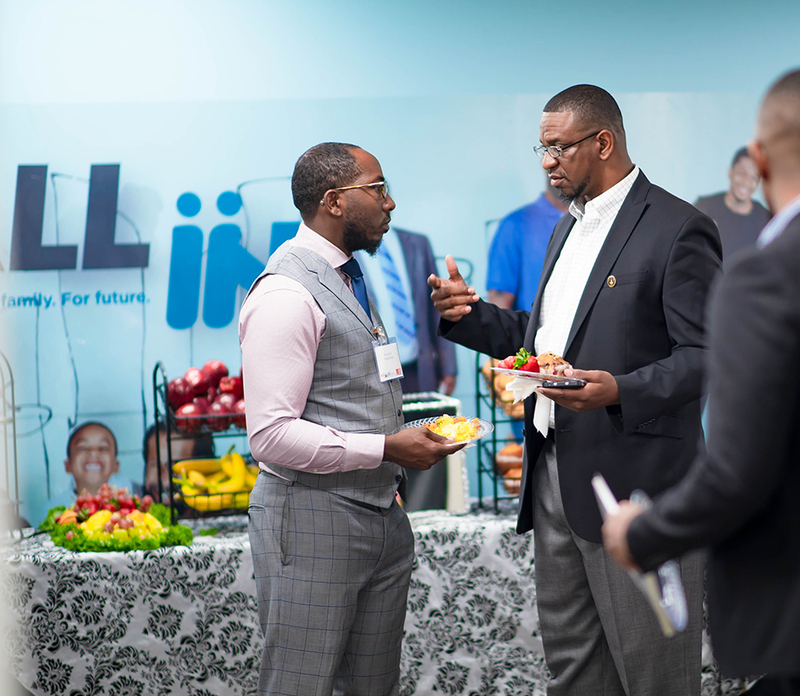 The Center for Urban Families’ Practitioner Leadership Institute intends to build on its reputation as a leading social service and community based organization focused on developing practitioners working in the field of Boys and Men of Color (BMOC). Turning its attention to local grassroots leaders who need specific support, PLI will focus on building leadership capacity for Baltimore based individuals and organizations. This investment will help lift the most vulnerable communities by retooling leaders, building community networks and developing the future city leaders. You're Welcome in our Home. Our office in Baltimore is part training facility, part counseling center, part staff offices, but it’s all Home to us. We invite you to come see our work first-hand through a guided tour of our facilities. You’ll be able to meet us and speak directly with our workforce development and family strengthening staff, our Baltimore Responsible Fatherhood Project staff, our senior leadership team and other key CFUF staff members that help elevate our organization to be a recognized national leader in providing services for fathers and families. Want to swing by? We’d love to give you the grand tour. For more information on this, or if you have questions about our training and technical assistance services, please contact us today.